A pristine stretch of soft white sand and the gentle murmuring of the waves can provide an exquisitely romantic setting for a marriage proposal, but the setting is just one facet of the plan. You still need to decide how you're going to carry it all out. Think about your partner's personality, and then try to create an ideal proposal that's bound to inspire an enthusiastic, "Yes!" There are many ways to make a romantic proposal in this setting. Picture the two of you on the beach, perhaps walking along hand-in-hand as you listen to the rolling waves and the breeze drifts across you. As you walk along, you come to a spot where something is written in the sand. You pretend you've never seen this message before but, in fact, you wrote it just a few hours earlier in a spot that won't get washed away when the tide comes in. You ask your partner what the messaage says, and as she reads it, you pull the ring box out of your pocket and have it ready for her when she turns around toward you. There's something magical about building a small bonfire on the beach. Pick a secluded location where high tide won't reach and wind isn't very strong, and set up the bonfire ahead of time so it's ready for lighting when you get there. As the two of you snuggle together gazing at the burning embers, tell her that she's very much like that fire. She's the light of your life, and she sets your heart on fire everytime you look at her. Tell her you can't imagine anything more wonderful than coming back to this beach every year to celebrate the anniversary of this moment, and then show her the ring and propose. In another scenario, imagine the two of you having an intimate, romantic picnic at the beach on a moonlit night. Keep the meal light with wine, cheese, bread and fruit. When you've finished eating, pour another glass of wine for each of you and tell your partner you have one more treat to share. Reach into the bottom of the picnic basket where you have carefully hidden the ring box, and set it gently on the blanket in front of her. Tell her the only thing more beautiful than the reflection of the moon on the water is the site of her face, and that you can't imagine sharing your life with anyone else. Give her your heartfelt proposal, and then wait patiently for her reply. Part of a great proposal is creating an image your partner will remember for the rest of her life. Take a lazy, barefoot stroll along the water's edge. When the moment is right, stop and gently drop to one knee. This gesture alone is going to send her over the moon because she'll know exactly what's about to happen. Choose your words carefully, make them sincere, and end with that phrase every marriage-minded girl dreams of hearing one day, "Will you marry me?" Take your partner to the beach for a picnic. When you're just about finished eating, pretend like you see something along the shoreline. Trot over there as though you want a closer look, and take the opportunity to pull a small bottle out of your pocket in which you have a note with your proposal. 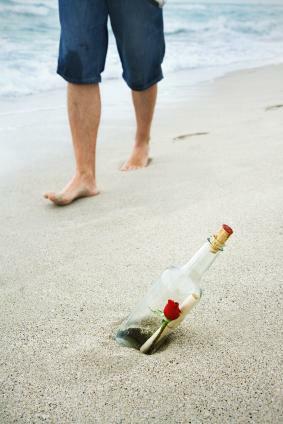 Bring the bottle back to your partner, and ask her to open it and read you the note. When she reads it, pull out the ring you bought for her and give her a moment to put the two together. Once she clearly catches on to what's happening, ask her to marry you. If you want to make a proposal that truly fits the setting, and you're sure your potential fiancee will appreciate an off-beat proposal, consider burying the engagement ring in a small treasure chest in the sand at a secluded area of the beach. Better yet, pick the location, and have a trusted friend bury it for you can keep watch over it until you get there. Leave one end of the treasure chest sticking out of the ground slightly so you can spot it and ask your partner what she thinks it might be. Encourage her to dig it out of the sand and open it. When she finds the ring, tell her she's the real treasure and ask her to marry you. Finding a pearl in an oyster is an amazing thing anyone can appreciate, so why not try an engagement ring in a shell? You might need to actually purchase a shell big enough to hide the ring in without getting it jammed inside. Take your partner to the beach, and tell her you want to look for pearls. She'll probably think you're being a little silly, but just convince her to go with it. When she's looking the other way, pull the shell out of your pocket, and place it in plain site. Point it out to her and ask her if she checked that one. Watch carefully in case she spills the ring onto the ground when she picks it up. When she finds the ring, tell her how lucky she is and ask her if she'll make you the luckiest man in the world by marrying you. Splurge on a tropical vacation for the two of you. Spend the day seeing the sights, and then plan to have a romantic dinner followed by a walk on the beach. When you think it's the right moment, tell your partner how glad you are that she's here with you in paradise, and tell her the only thing that could make the night more perfect is if she would agree to marry you. Make sure you have a ring for her so she knows your proposal isn't an impulsive one, and she'll feel more inclined to say yes right away. When money is no object, fireworks can make an amazing backdrop for a marriage proposal. Hire a party planner to arrange a fireworks display at your favorite beach. As you and your partner are watching the display, tell her you arranged the fireworks to show her what goes on in your heart everytime you look at her. Pull out your engagement ring, and tell her this diamond is just a symbol of one sparkle from the fireworks, but it's one the two of you can share the rest of your lives if she'll marry you. An oceanside couple's spa retreat can set the scene for a very romantic proposal. Spend the day partaking in relaxing treatments together, like a warm mud bath and a hot stone massage. Take your partner for a candlelight dinner on the beach, and order Champagne for a toast. Work your proposal into that toast, and give her the box with the ring. When she says yes, you can clink your glasses together to seal the moment. Smells: Is the ocean breeze the only scent, or does the beach smell like an old aquarium? Sounds: Waves vary in volume, and a whispered question won't be heard over thunderous breakers. Sand: Is the sand easy to walk across? Is it clean or dirty? How far is the walk to the water? Company: Is the beach crowded or isolated? 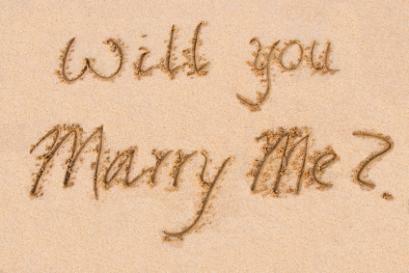 Will an intimate proposal be disrupted by other beachgoers? Every anxious and hopeful groom-to-be can find different ways to propose on the beach whether he is interested in a romantic, creative or extravagant marriage proposal. When the natural beauty of the water combines with the beauty of your love, the only trick is to avoid drowning in the moment..